This dish is my new weeknight best friend. It's quick, easy, crowd-pleasing, and best of all, it's versatile. The possibilities for playing with types of protein, veggies, and even pasta shapes are limitless. Want rotini with ground turkey, broccoli, and alfredo sauce? Penne with veggie soy crumbles, artichoke hearts, and arrabiata sauce? Or maybe rigatoni with asparagus, ground sausage, and mushroom marinara. See what I mean? It's like a game. How many combos can you come up with? 1. Heat oven to 400° F. Cook the pasta according to the package directions. Drain and return it to the pot. 2. Meanwhile, heat the oil in a large skillet over medium heat. Add the onion and garlic and cook, stirring occasionally, until they begin to soften, 4 to 5 minutes. Add the beef, ¾ teaspoon salt, and ¼ teaspoon pepper and cook, breaking up the meat with a spoon until it's no longer pink, 5 to 6 minutes. 3. Toss the pasta with the meat mixture, marinara sauce, spinach, ricotta, and ¼ cup of the Parmesan. Transfer to a 9-by-13-inch baking dish, 2-quart souffle dish, or 4 large ramekins. 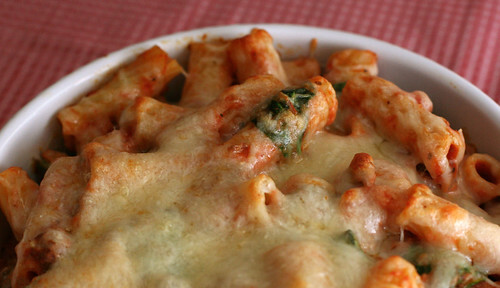 Sprinkle with the mozzarella and remaining ¼ cup of the Parmesan and bake until the cheese melts, 12 to 15 minutes. Sweet. I'm always looking for easy weeknight meals. Thanks! Popped in to say hi! This looks great and so much better for our house of two than a huge lasagna! Yummm! I made something similar to this last week, and it was SO good. Like lasagna, but easier and (for me, anyway) even better. I'm looking forward to making it again, and this time I'll do your variation with ground beef and spinach! Looks great!! Always looking for a great weekend meal!! I agree with Blonde duck perfect for two people instead of a hugh lasagna!! Thanks! this looks perfect! so hearty and delicious!